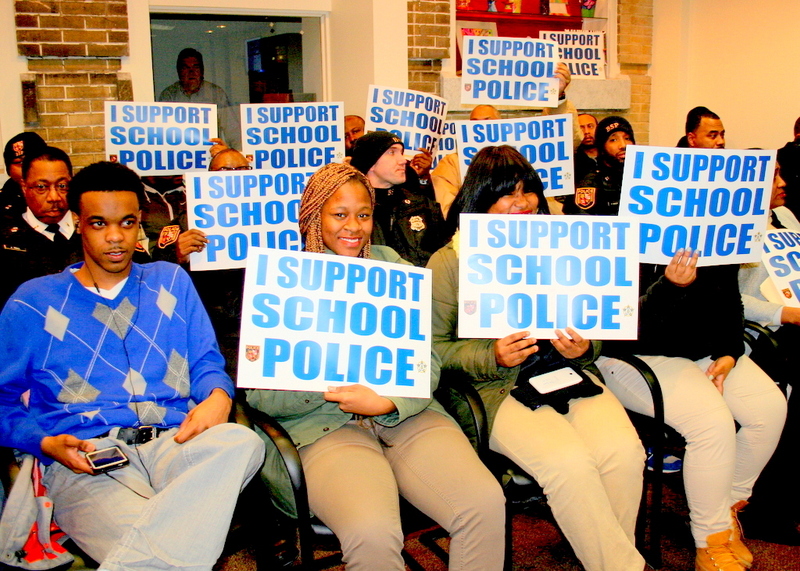 Above: Supporters at a hearing on a bill to allow Baltimore school police to carry guns in school buildings. The president of the city school police union said last night that being a good protector of students means having immediate access to your weapon. “In our industry, seconds mean lives,” Clyde Boatwright, a veteran police officer told the city school board. Boatwright was one of more than 40 current and retired school police who came to school system headquarters in support of a state bill that would allow Baltimore City School Police to carry their guns in school buildings. He didn’t hesitate to reach for strong comparisons, even hyperbole. “We’re one heartbeat away from our town becoming the next Newtown,” he said. Before the meeting, on Facebook, he was even more inflammatory in his support of the bill. “I hope you all that are opposed understand that the blood of our babies will be on your hands if you disarm our officers,” he posted, to Del. Antonio Hayes’ Facebook post, asking for feedback on the bill. Boatwright’s post later prompted objections from parents who have been organizing against the measure. Melissa Schober, a city school parent who attended the hearing and opposes the bill, called him out for his post. She read part of it to the school board and into the record. But supporters, led by Boatwright, say the schools police officers need to be armed because of Baltimore’s “challenges,” in particular, violent crime. He said there had been 78 lockdowns at Baltimore schools in recent years due to the threat of armed persons nearby. The legislation ignited strong feelings on all sides. Supporters of the bill came out from several schools including Mergenthaler Vocational Technical High School (Mervo) and Digital Harbor High School. Craig Rivers, principal of Mervo in northeast Baltimore, testified in favor of the bill, citing eight recent homicides in Mervo’s police precinct. Jose Portillo, an ESOL student at Baltimore Community High School, testified against the bill. Instead of seeking to carry guns, he said through an interpreter, school police should work on cultural competency. “Many [ESOL] students come from countries where police are part of a corrupt system and not to be trusted,” Portillo said. He called on the officers to develop relationships with ESOL students to establish better trust and asked the school board if school police have access to interpreters. Darius Craig, student government president at Digital Harbor, testified against the bill and said via a prepared statement, that school police behavior is a number one concern at Digital, which has had some high-profile incidents involving students at the Inner Harbor. Kim Humphrey, representing the American Civil Liberties Union of Maryland, also criticized the school board’s handling of the bill: first for not allowing public comment on the law before it was introduced, and second for not informing parents about the legislation. “You didn’t even advise the City Schools’ Parent and Community Advisory Board about this,” Humphrey, who noted that 90% of school arrests in Maryland take place in Baltimore City,testified. Are Police Carrying Weapons in Schools Anyway? Currently, school police can have guns nearby in case of a threat, but may not routinely carry them on their person in the school building during school hours. That prohibition has been in place since the 1990s, when school police were elevated to the level of law enforcement officers certified by the Maryland Police Training Commission. Under the provisions of the bill (introduced by Sen. Joan Carter Conway and Del. Curt Anderson) city schools police would be able to carry them on their person in the school buildings during the regular school day. 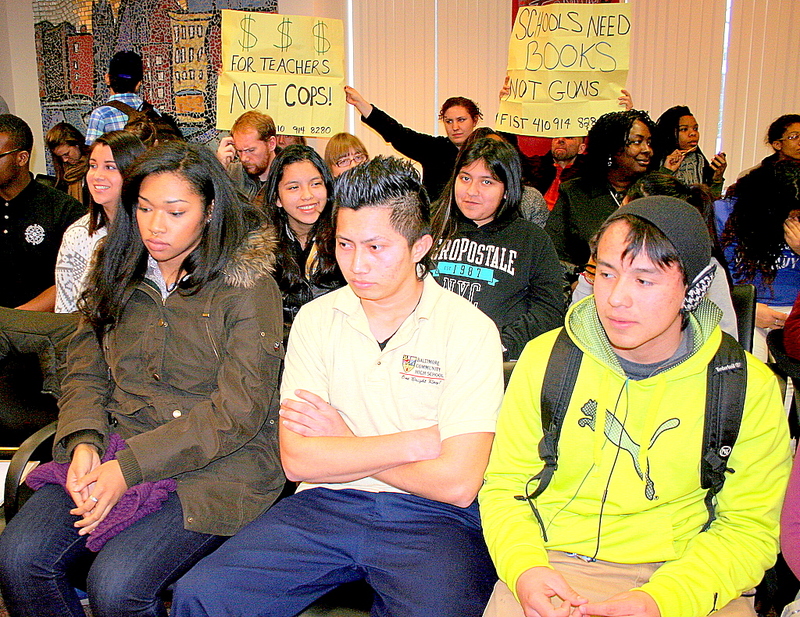 But that change puzzled some in the audience and after the meeting, as school police, including Boatwright, acknowledged that “school cops,” as the students call them, currently sometimes do bring their weapons in the building. “School police officers are duly trained and certified police officers who are issued firearms. School police officers have their weapons EVERY DAY!! !” Boatwright said on Facebook. “This is not new legislation people; it is simply to correct the issue of school based officers being allowed to carry during the school day without restrictions,” he added. So what is driving the push for formalizing the officers’ “right to carry” if they are carrying already? City schools police are currently classified as civilians in the city pension system, rather than sworn police officers. School police have long pushed for improvements in their pension and disability compensation that would translate into more money, pushing in Baltimore and Annapolis for a shift to the city’s fire and police pension system or state’s law enforcement pension system. The Brew reached out to Boatwright, but his voicemail box was full.